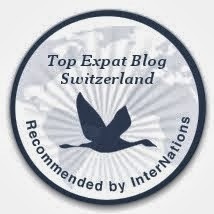 erniemcpeck - Adventures in Switzerland: Penguins! For my birthday last year my parents-in-law gave me a unique opportunity - to feed the penguins at the Paradise Wildlife Park in Broxbourne, England. Those of you who don't know me might not know that penguins are my absolute favourite animal in the whole world, so this experience was something I was truly looking forward to. I was made to wait for it though. 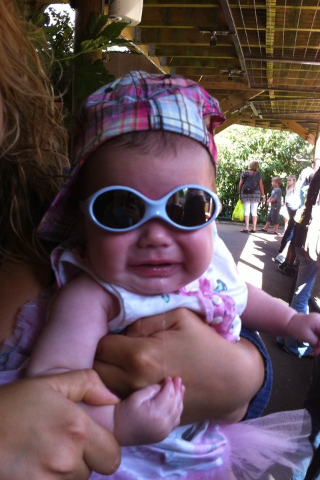 I had booked the experience for last summer, but unfortunately we were informed by the people at Paradise Wildlife Park that they had to close the penguin enclosure for maintenance, so my experience would have to be re-scheduled at a later date. So, I rebooked it for this summer, after the wedding of my brother James and his new wife Kelly (see my last blog, "Congratulations James & Kelly"). 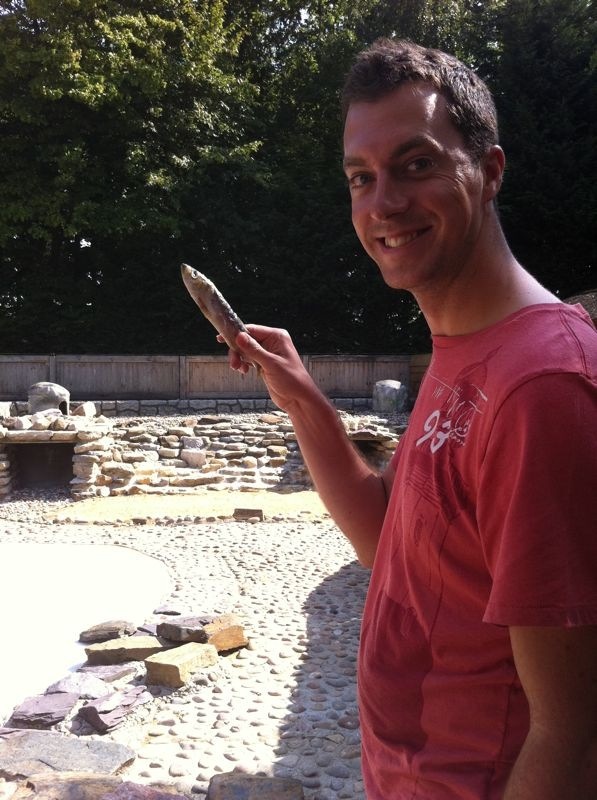 Me with a dead fish. ﻿ After the fun and celebrations of the wedding, the day came for me to fulfil a dream by feeding dead fish to some aquatic birds. As Nelly and Bernard were with us in England for the wedding, it was an ideal opportunity for them to watch me feed the penguins, and therefore enjoying the present they had given me so long ago. However, they also wanted to make use of their trip to England to do a bit of shopping to find clothes for the wedding of their other daughter, Caroline, in August and September (a civil ceremony followed by a bigger, more traditional wedding). Together with Christelle, they headed to Milton Keynes on the Saturday morning with the intention of being back before my penguin experience started at 3pm. Meanwhile, Lydia and I spent the day with my family so they could have as much time as possible with her before we had to head back to Switzerland. 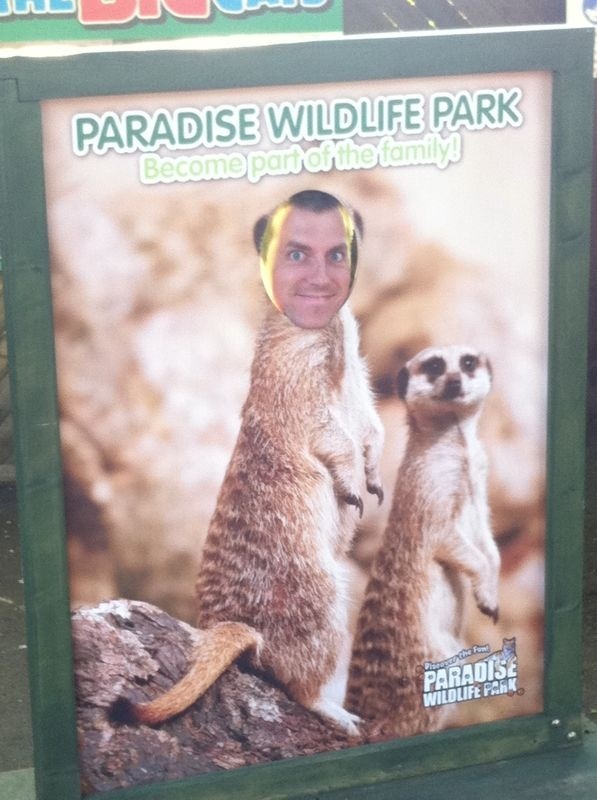 We had planned for them to join us at the wildlife park around 2-2:30pm. However, when Chris rang me at 2pm they were still in Milton Keynes. Not a good sign - it usually takes at least an hour to make the drive from Milton Keynes to Datchworth (where my parents live), and Broxbourne is even further away. I remember thinking how it was a big shame that they might miss me feeding the penguins, especially as it was their gift to me. Hey little guys, fresh fish! ﻿ As 3 o'clock approached, I headed into the discovery centre to let the keepers know I was there. I was expecting to be feeding the penguins as part of a big group of people, but it turns out I was the only one doing it that day - what a bonus! The penguin keeper then took me round to the penguin enclosure and showed me how they prepare the fish before giving them to the penguins, and I was full of excitement as she lead me out into the penguin enclosure in front of a group of no doubt highly envious people who were there (behind the enclosure barriers) watching another keeper give a talk on penguins. 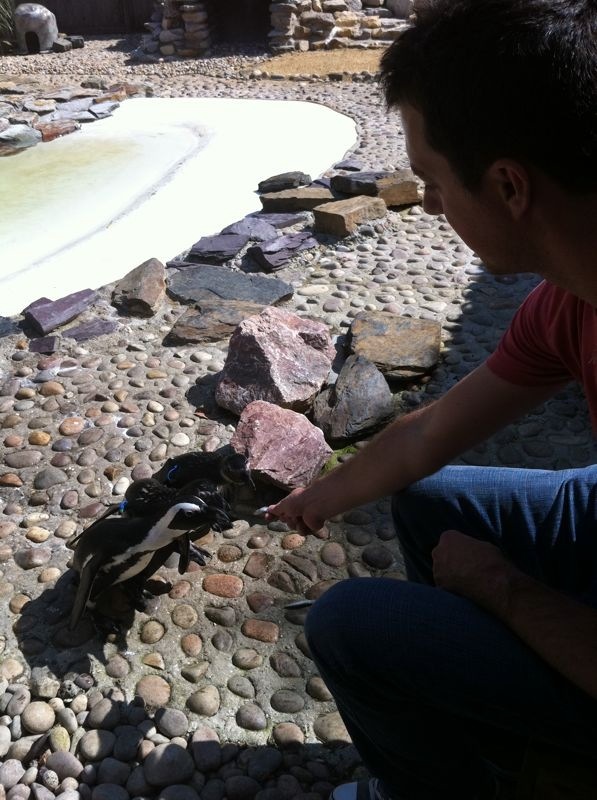 Then I began to feed the penguins. It was fantastic - the keeper called out "FOOD!" to the penguins and they all slowly, nervously began to waddle over to where I was sitting. Penguins are very fearful creatures so if one of them retreats, they tend to all retreat. Luckily, the penguins must have had a particularly brave day, as the majority of them waddled over to me and took fish right out of my hands. It was amazing! I had to be very careful when feeding them the fish as penguins have lots of sharp bristles inside their mouths that they use to catch fish in the open water - it would be pretty painful to get a finger trapped in their mouth! ﻿ As I happily fed the penguins, I heard someone shout "Paul!" from the spectator area, and as I looked for the source of the voice I was delighted to see Chris and her parents had made it back in time to see me (Chris later admitted that they had driven a little bit over the speed limit on the way there, evidenced by Bernard's slightly shaken appearance - must have been a bit of a white-knuckle ride!). Buoyed by their presence, I gleefully continued feeding my little flightless friends, and when the bucket of fish ran out the keeper was kind enough to refill it for me (something they don't usually do), so my delight continued for longer than expected. 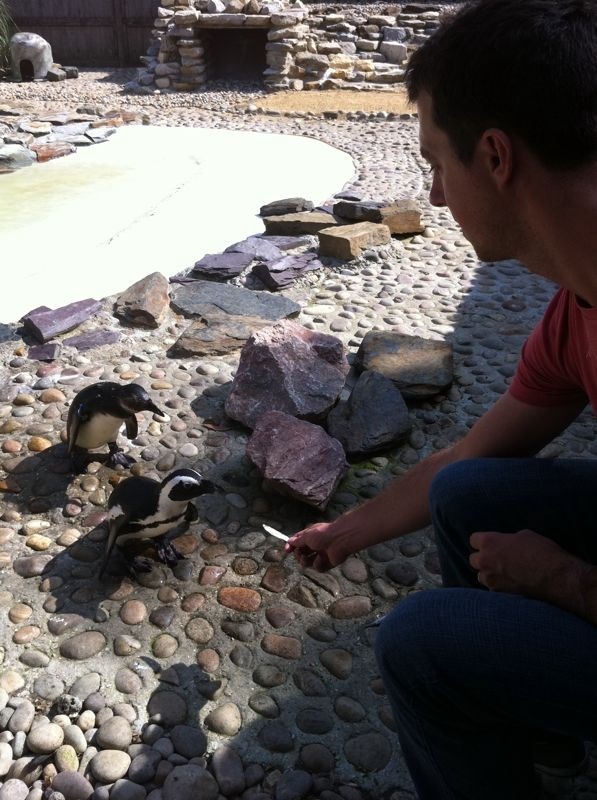 When the little guys stopped coming to get the fish from me, and prompted by the keeper, I began throwing fish into the pool to let the penguins swim for their food. That was really fun, and seeing penguins cut through water so fast and gracefully is quite a contrast to their clumsy, waddling demeanour on land. I enjoyed every minute of the experience, and received a nice t-shirt and certificate as a souvenir of my day. We wandered around the rest of the park for another couple of hours, but in all honesty I was in a penguin daze so I'm not sure how much I appreciated the other animals... I think there were tigers, lions, lizards and other assorted creatures that normally would have delighted me, but not this time. I had already seen one of my life's dreams fulfilled that day, so no amount of big cats or scaly snakes could make an impression on me. Thanks so much to Nelly and Bernard for their present, it really meant a lot to me. Now, on to my next dream - seeing penguins in their natural habitat. If I start saving for that now, I might be able to afford it by the time I'm retired.